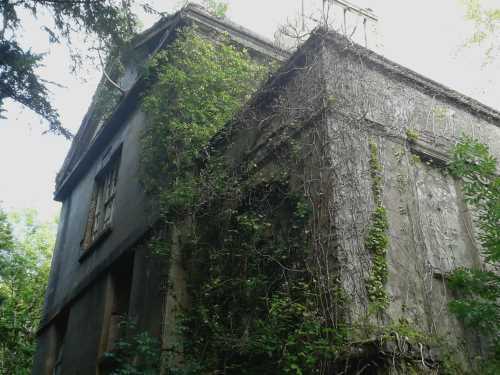 Baron Hill is a now ruinous estate near Beaumaris, Anglesey, North Wales, once owned by the Bulkeley family, and was originally built in 1618 by Sir Richard Bulkeley. 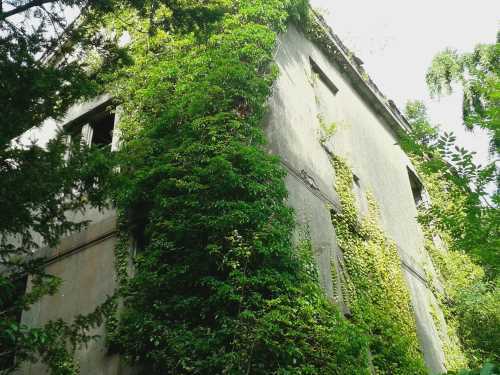 The deserted, empty shell of the once beautiful house is now covered by foliage, nature having taken over the Bulkeley family seat. The site is eerily silent, with only the rustle of the breeze against the leaves and the occasional bird song breaking the dead quiet. 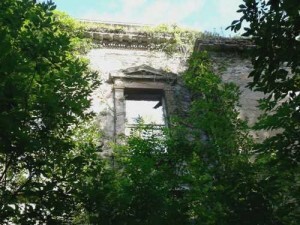 The golden sunlight filters through the trees to reveal the remnants of the once glorious building. During the English Civil War, Richard’s successor, Colonel Thomas Bulkeley, is said to have invited King Charles I to take control of the house and set up his court there. In the eighteenth century, the house became the seat of Lord Viscount Bulkeley, who held Jacobite sympathies. The Neo-Palladian style of the building is apparent from the curved facade of the house to the terraces, follies and the grandeur of the balconies; this was the style adopted during the 1776 reconstruction of the mansion by architect Samuel Wyatt. There is also an icehouse in the gardens, a lodge house, and other outhouses that are also now abandoned and overgrown. The gardens themselves are now totally overgrown. Edward VII, who was Grand Master of the United Grand Lodge of England, visited the house in the early years of the 1900s, and the accompanying picture shows the King sat outside the curved façade of the house. Another Masonic connection to the Bulkeley family was William Jones; Jones was a particularly gifted mathematician who was born on Anglesey in 1675, and he was so proficient at calculation that Bulkeley, his landlord, set him up in London, where he became a Fellow of the Royal Society and a Freemason, belonging to a London lodge. A certain Richard Bulkeley Esq., was mentioned as a prominent Freemason in a lodge in Nova Scotia in the later eighteenth century, though unlike the Watkins William Wynn family, the Bulkeley’s of Baron Hill did not take up prominent positions in North Welsh Freemasonry. By the time we come to World War I, with the advent of death duties, the family (by then called Williams-Bulkeley) found it difficult to maintain the costs of running the house, and by World War II, the Royal Engineers were stationed there. It was later damaged by fire and has been abandoned ever since. 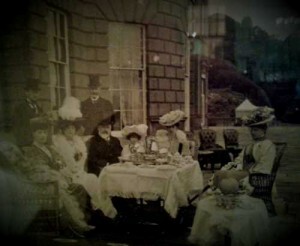 Many thanks to the Bulkeley Hotel in Beaumaris where the photograph is currently on display.